The 4-and-a-half Frontiers of Engagement are conveniently represented by the shape of the number 4 itself. 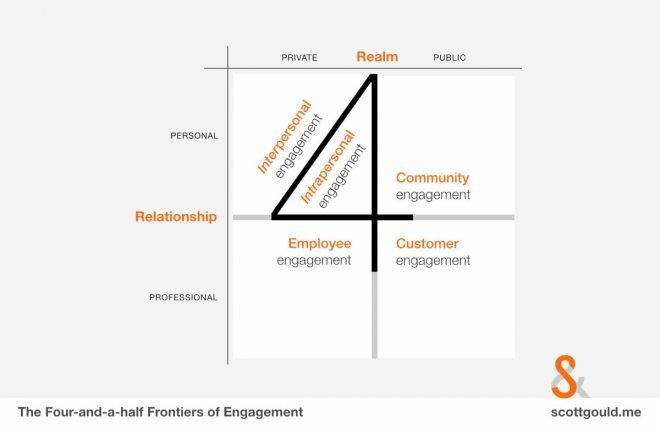 The vertical and horizontal lines form a 2×2 matrix: the top right, bottom right, and bottom left quadrants are the three main recognised professions of engagement that I refer to throughout the book; customer, employee, and community engagement. The top left quadrant is marked by the diagonal line that really makes this shape a number 4, and not just a peculiar cross. It’s this quadrant that accounts for the fourth frontier of engagement and the extra half. These are the ‘personal’ spaces of interpersonal and intrapersonal engagement. There are two axes. The vertical is relationship, which is either personal and non-financial, or professional and therefore by definition, financially-based. The horizontal axis, realm, juxtaposes the public and private worlds. It’s the difference between what happens within a mostly closed, internal system, or that which happens open and mostly externally from any single organisation. Engagement as a concept does not sit squarely in the marketing camp, or solely in employee engagement, or purely as a civic discipline. Engagement can be found everywhere that humans come together, because it is about relationship. We could equally talk about employee engagement and friendship engagement, because the mechanics of engagement on a psychological level are happening in the same way in both contexts. Internal or Employee Engagement is about how engaged staff, internal stakeholders and internal communities are. It is usually a function of HR. Most engagement theory has been written from this area. It is generally commercial driven, and happens within a contained network (one needs to be employed to be engaged by the company). External, Brand or Consumer Engagement is the commercial manifestation of engagement, and sits within marketing departments. Brand Engagement tends to represent the consumer’s side of the relationship, whereas Consumer Engagement is the organisation’s side. It is by definition commercial driven, and usually occurs within an open network (others can become consumers quite easily). Civic, Community, Constituent, Citizen or Social Engagement is usually within the third sector or government. It is about how engaged people groups are (such as members of a club or community, citizens of country, or residents within a parish). It is normally non-commercial and instead driven by social factors, and is usually within an open network. Inter-Personal Engagement is engagement between friends, families, romantics partners, etc. It is non-commercial and purely on a social level, and happens within the contained network of who one selects as ones friends.